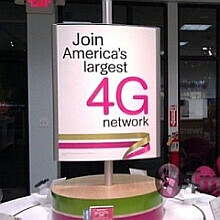 T-Mobile has launched their 42Mbps HSPA+ service in 47 more markets. That brings their 42Mbps total to 102 cities. Unfortunately, those speeds can only be harnessed by the Rocket 3.0 USB modem. Akron, OH; Albuquerque, NM; Allentown-Bethlehem, PA; Brownsville, TX; Cape Coral, FL; Canton, OH; Charleston-North Charleston, SC; Cleveland, OH; Colorado Springs, CO; Columbia, SC; Columbus, OH; Corpus Christi, TX; Fayetville, NC; Florence, SC; Fresno, CA; Harrisburg-Carlisle, PA; Hickory-Lenoir-Morgantown, NC; Killeen, TX; Lakeland, FL; Lancaster, PA; Las Cruces, NM; Madera, CA; McAllen, TX; Merced, CA; Myrtle Beach-Conway-North Myrtle Beach, SC; Napa, CA; Palm Bay, FL; Palm Coast, FL; Panama City, FL; Pueblo, CO; Reading, PA; Riverside-San Bernadino-Ontario, CA; Sacramento-Arden-Arcade-Roseville, CA; Salt Lake City, UT; San Antonio, TX; San Diego-Carlsbad-San Marcos, CA; Santa Barbara-Santa Maria-Goleta, CA; Santa Fe, NM; Sarasota, FL; Scranton-Wilkes-Barre, PA; Sebastian, FL; State College, PA; Virginia Beach-Norfolk-Newport News, VA; Wilmington, NC; Visalia-Porterville, CA; Waco, TX; and York-Hanover, PA.
T-Mobile announced that Phoenix was upgraded to 42Mbps HSPA+ service back on May 24th. the merger wont make ATT speeds faster. Tmo and ATT share the same voice signal but not the same data signal. Your still stuck with ATT speeds until they start making phones with antennas for both network's data signals. wheres baltimore md or D.C. ?? ?